Chris Perkins (standing) runs a game of D&D for Acquisitions Inc., which includes Jerry Holkins and Mike Krahulik from Penny Arcade, Scott Kurtz of PvP and fantasy novelist Patrick Rothfuss. 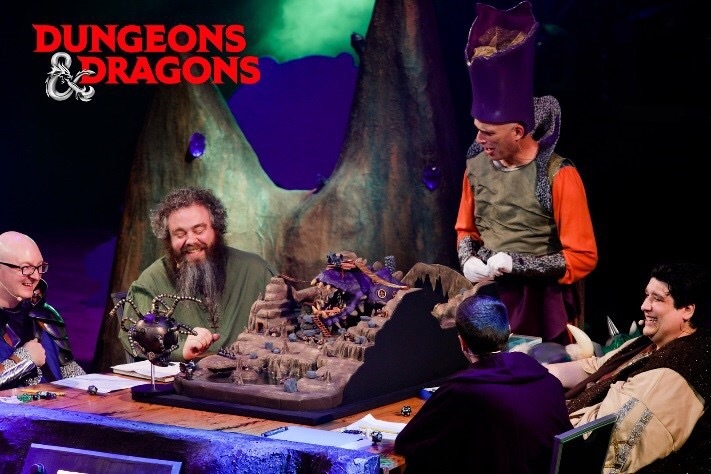 Over the weekend, Chris Perkins ran a D&D session seen round the world in movie theaters. The latest game from Acquisitions Inc. (featuring Penny Arcade, PvP and fantasy author Patrick Rothfuss) went down Sunday evening at PAX West. I spoke to Perkins, D&D’s principal story designer, and Greg Tito, co-host of D&D’s Dragon Talk podcast, for a story I wrote for the Omaha World-Herald, and asked a whole lot of questions that didn’t make it in the final product. So here’s the rest: talk about PAX, Storm King’s Thunder, DMing and the state of Dungeons & Dragons. Crit For Brains: How is PAX? Chris Perkins: So far so good. We’re in the D&D play area and there are crazy crowds as usual. It’s pretty vibrant and active. We’ve got a lot of games going right now tied into Acquisitions Inc.
CFB: In Storm King’s Thunder, it’s a bunch of PCs against a host of giants. How do the players face off against the threat? Perkins: The DM has a fair amount of leeway. There are many on-ramps to the adventure. There are plenty of places to start it. You can start at 1st level or at higher level and the DM makes choices then jumps onto the game. At 1st level, you’re a fairly weak character. You’re not going to slay fire giants any time soon. You’re like a character in The Walking Dead series. You can’t walk up to zombies and think that’s going to go well. You’ve go to be smart. You’ve got to know what’s going on. Run away occasionally. Survive long enough until you get to a point where you can face the giants directly. For higher level characters, you can come in and go after the higher level giants immediately or be asked to defend some towns. CFB: What do you think about how much everyone is talking about D&D right now? It was an integral part of Stranger Things, and people like Anderson Cooper are talking about loving D&D on late night TV. Greg Tito: For us, it’s a gratifying surprise and delight to some extent. Stranger Things is a good example. That came out and everyone in the office was abuzz and talking about how exciting it was that D&D was portrayed where D&D was actually integral to the plot. It was so much a huge part of it. Something that Mike Mearls said to me was the best thing about Stranger Things as that the characters didn’t have any compunction about how they’re going to defeat the monster. They said, “There’s a monster in our world. Let’s go kill it. What tools do we need?” And that’s how you’d do it in D&D. The amount of D&D that’s permeating culture in general is super interesting to us. We want to keep feeding that loop. It’s like people gathering around a fire and telling stories is something people have done for thousands of years and it dips into that need for people to tap into that storytelling and things that happen that are larger than you. CFB: And how is D&D doing right now? I read sales have been strong and the Player’s Handbook had multiple print runs. Has that continued with the adventure book? Perkins: Very much so. Our most recent adventures have really defied our expectations regarding sales. Tito: This edition is selling way more than expectations based on previous numbers for previous editions. CFB: Chris, I know you give out a ton of advice to DMs, but what’s the one thing you wish you could tell every DM? Perkins: The rules are there to save you, not the other way around. A DM should absolutely feel the license to do whatever he or she wants in terms of the campaign and how they run their game. Don’t let the rules get in the way of the fun. They’re a crutch. They’re there to help you and that’s it. Campaigns are contingent on keeping your play groups together. One of the best ways is if you’re having trouble ask you players what kind of games do they want? What do they want to see? Then tailor it to them. I also tell DMs not to over-prepare… and to remember it’s a game and have fun. I don’t want DMs to feel stressed out. One thing I like is that DMing has been demystified. People feel like it’s something they can actually do. It looks more fun than daunting. I tell DMs just go for it, have fun, let the rules help you and try to tell the best story you can. CFB: I personally have been loving the adventures for 5th edition. I’m currently running Curse of Strahd. Perkins: I’m very proud of Curse of Strahd. It was a dream project for me. Before I started writing that, I took the month of October and watched a different horror movie every day. It got me in the headspace. I had to write the adventure over the Christmas break, and writing genre horror adventure over Christmas is just weird. CFB: How much do you plan when setting up these Acquisitions Inc. games? Those are four pretty creative guys who I’m sure can throw a wrench in things. Perkins: Well, the players never know what’s coming. They don’t see anything before they go out on stage. They know nothing. Everything they do is 100 percent improvisational. With me, I do a little bit of planning early in the year because we have to build sets and dioramas. I make some early decisions about where it’s going to take place, who they’re going to see and what it’s going be. After that, I pretty much leave it be. I’m working with the guys building the dioramas and that inspires me with coming up with ideas on the fly. About the only thing I do, the stuff I do normally as a Dungeon Master, is try to anticipate what the players might do. I’ve played with Jerry, Mike, Scott and Patrick for awhile enow. I know a little better what they might do. CFB: How is it DMing in front of a few thousand people? I’ve never done it anywhere but a living room or basement and the five or six people I’m playing with. Perkins: I am an introvert. I am not an extrovert. It feels very much out of my element. The week leading up to PAX is the worst week of my year, and absolutely the worst five minutes is the five minutes standing by myself waiting for the curtain to come up. Once the curtain comes up and the players are sitting around the table, it becomes like any other D&D game and it’s just me and my buddies playing through a game. At that moment, it’s easy and sort of second nature for me. I actually do forget the audience is there until they react to something and I have a moment of surprise. I actually have thought about not doing it any more because it does take time. But there are a number of people who have approached me and told me these games mean a tremendous amount to them. I’ve had service men and women tell me watching the games helps them pass time while serving abroad. Their experiences interacting with the game have really prompted me to realize what we do with these games is more than entertainment. For some people, this is survival. Because of that, I’m happy to do it until the end of time. I like the article, but in saying your an editor-in-chief, I think you should do another pass. The errors per sentence in this article are jarring.